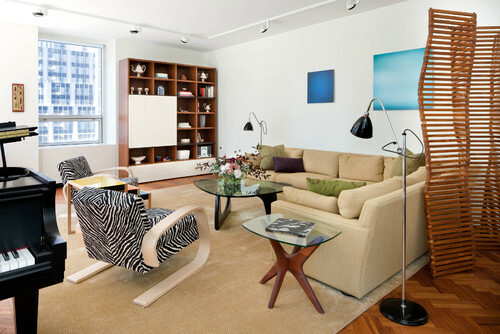 Animal prints glam up a room better than almost anything. First, is to use only in moderation. ONCE is enough. This is an accent, not the main attraction. Second, make sure you repeat the color of the animal print somewhere else in the room. The key is not to overdose so that it kills the look. You can overdose some themes, and succeed. But, animal prints are not for overdosing. It takes a practiced hand to repeat the colors without overdosing the accent fabric. Take a look at some gorgeous examples. Below, the gold and the black of the leopard ottoman are repeated in the portrait. 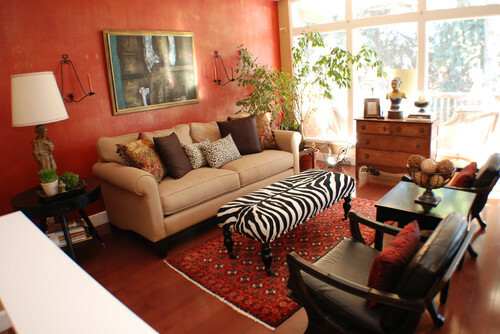 Is there a place for an accent animal print in your home? It can be done very tastefully. Just remember to use as an accent. And repeat the colors in the animal print elsewhere in the room. This entry was posted on January 29, 2013 by Ellen at Color Calling. It was filed under Art, Decorating trends and was tagged with animal prints. Great post, Ellen, and dare I say SPOT-on. Thank you, Frances! Too funny!